I am trying to push all of my iPhone contacts into my Google contacts in preparation for dumping my iPhone. IOS 12.1.1 is different than all previous versions in this respect. Settings->Accounts->Gmail : Contacts is turned on. Shows my google account. Settings->Accounts->Fetch New Data: Gmail show Fetch, Every 15 minutes. Settings->Accounts->Passwords: Shows correct password for my google account. Account->Advanced: Use SSL turned on. Server Port 993. Verified that I can log into my google account from Safari. My iPhone contacts shows 220 contacts. My google contacts shows 144 contacts. Google is missing everything manually entered into my iPhone this year. I also tried iTunes, syncing to Windows Contacts. It picked up only 76 of the 220 contacts. Also tried iCloud. That picked up the same 76. If I put together what Google shows with the iCloud/Windows Contacts, I think all 220 contacts shown on the iPhone are there. Did you check in the settings of the Contacts app that the default account is set to your Gmail account? I suspect that the presumably missing contacts ended up in iCloud instead of Gmail. If you set the Default Account to Gmail new contacts created on your iPhone will automatically sync with Goolge Contacts. The easiest way to move your contacts from iCloud to your Gmail Account is to use the Contacts app on your Mac. Add the same Gmail Account to your Mac and drag’n’drop the contacts from iCloud to your Gmail Account. I don’t think a way exists to do the same directly on an iPhone. Contacts that are in the iPhone's Contacts account do not sync to Google. That's not how it works. You're thinking of it as being a single container of data on the phone, and it's not, each account has its own. That's why the phone has the setting allowing you to choose what the default Contacts destination is. 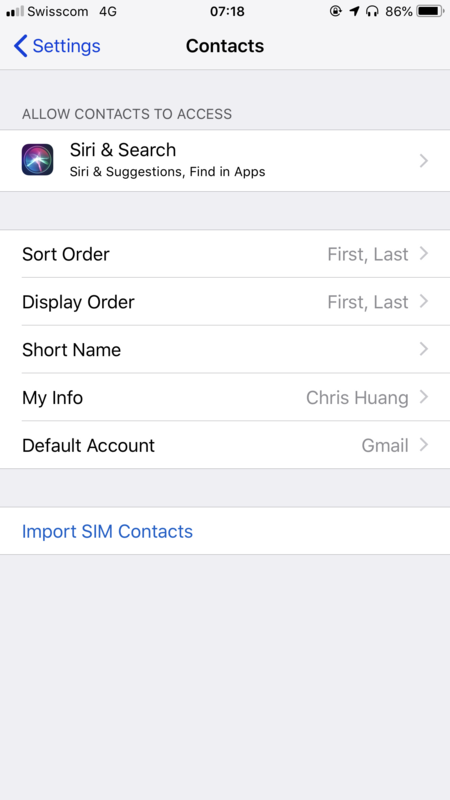 There are several apps available in the app store that will take the iPhone Contacts and sync them to some other account on the phone. I have used Contacts Mover, https://contactmoverapp.com, for this purpose. Not the answer you're looking for? Browse other questions tagged iphone contacts gmail . How do I sync my Google calendar with my iPhone? How do I sync contacts with Gmail on an iPhone 5? How do I make a contact in Google Contacts show up on my phone? Why don't my icloud.com contacts download to my iPhone?